Grow your account your way. There are plenty of ways for you to grow your account on your own schedule. Recurring contributions are an effortless way to add to an account without having to remember to write a check. You can establish contributions into your NEST Advisor Plan account directly from your personal bank account or you can contribute from your paycheck. Investing in a college savings plan has many intangible benefits as well as financial benefits. Whether you start with $100 a month or $400 per month, recurring contributions and earnings get the benefit from the power of compounding. Each month your contributions and the earnings on past contributions have an opportunity together to increase due to market action. The sooner you begin, the more time your savings will have to work for you. This illustration shows the benefits of monthly contributions, by check, or through systematic contributions either directly from your bank or from your paycheck. 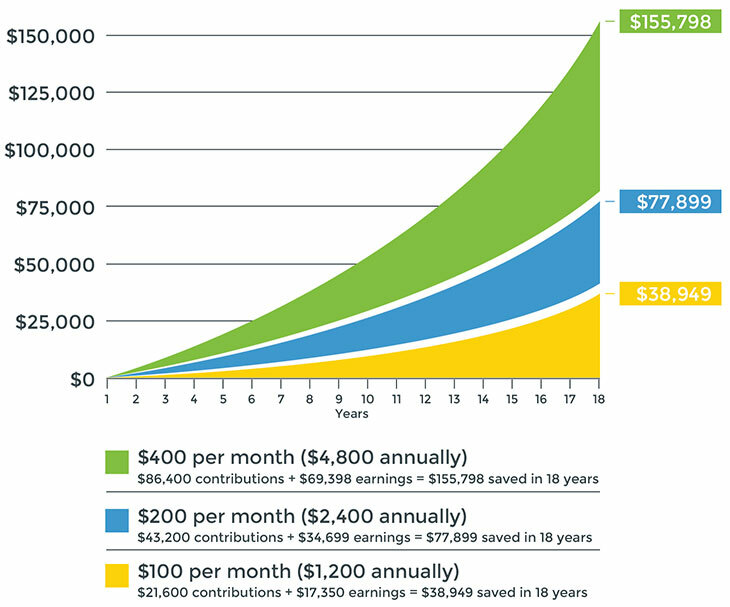 *This chart illustrates an investment of $100, $200 and $400 a month on the first day in the month into a college savings account that earns 6% per year, compounded monthly. This hypothetical is for illustrative purposes only. It does not reflect an actual investment in any particular college savings plan or in the NEST 529 Plan. Put your contributions on autopilot. With AIP, you can set up automatic contributions to your NEST Advisor Plan account - on the schedule that works best for you - from your checking or savings bank account. If your employer offers direct deposit, you can sign up for payroll deduction anytime with the NEST Advisor Plan. Link your bank account to your NEST Advisor Plan account and contribute any time you like. Sign up for this simple feature that will automatically increase your AIP contributions annually. After you're set up, your contribution will be adjusted each year in the month you specify by the amount you request. If you already have an account, you can log into your account and click on "Manage Recurring Contributions" then follow the steps to set up this feature. Or, you and your advisor can set it up while opening an account. The Systematic Exchange Program allows you to exchange from one investment option to another investment option within your account on a pre-scheduled periodic basis. It will not be counted toward the twice per calendar year investment change limit. There are no extra charges for contributions made for AIP, Payroll Deduction, EFT, or Systematic Exchange. 1 A plan of regular investment cannot assure a profit or protect against a loss in a declining market.